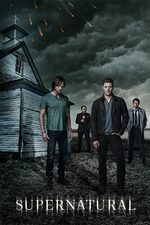 Sam and Dean help Donna investigate her niece's disappearance and discover a gruesome crime network. Wasn't sure how much to put into the description without spoiling, so I went with the safest. I was sure this storyline has been done before, but I must have confused it with other shows. You'd think Supernatural would've done this story a while ago, but nope. It's definitely interesting though. Like the zombies on iZombie needing a legitimate source of brains without going out attacking normal humans. I wonder if there is a huge network for monsters that hunters just aren't aware of. And how much would the British Men of Letters been able to discover and help with if they weren't total assholes. Also, that just reminded me that we haven't seen jack squat about Asmodeus and Ketch. I’m always happy to see Donna - though one of the reasons I love to see her is because of what a ray of sunshine she is, so I’m sorry they gave her a break-up. Still, they didn’t go for Winchester-level angst of Donna having to kill Vampire-Doug or of not saving her niece from torture and death. Are they just getting her freed up from romantic entanglements for the spin-off? Are they just getting her freed up from romantic entanglements for the spin-off? Yeah, I'm pretty sure it was that. She's presumably gonna move to Jody's town and help mentor the girls. My girlfriend pointed out that Donna's accent was really played down in this one. I can see why they'd do that, to make the character a little less goofy so she can have more dramatic storylines. But her whole "Yah, you betcha" thing was part of her charm! we haven't seen jack squat about Asmodeus and Ketch. Actually, I've kind of forgotten where some of these people are right now. Actually both Castiel and Lucifer are captured by Asmodeus, in the dog cages that Crowley used to be in at Hell's Earth HQ *. (which, btw, I don't understand how it's still there given that after the boys raided it last season, the angels should eventually have figured it out and wiped it out by now). Wow. I have no memory of that at all. I'm liking this season fine, but Asmodeus has to be their most slow-moving big bad ever. He's like a B-plot baddie who somehow made it to the top. Usually we'd be hearing a lot more apocalypse talk by now! btw, I don't understand how it's still there given that after the boys raided it last season, the angels should eventually have figured it out and wiped it out by now). Because once they built that set, they weren't just gonna junk it! Speaking of sets, the next X-Files episode looks like it's set on a big rusty hulk of a boat that seems awfully familiar. Somebody in Vancouver is making bank renting out their big junked boat to genre shows! This episode seemed much darker than usual.